Even the Universal Pictures UK embed that Vulture uses disagrees, although you might miss the distinction at first glance. They have it labeled as a Trailer Teaser, a term that has very little paper trail online but works as a way to describe this particular “trailer for a trailer” inception strategy. It’s not that distinct from the way “trailers” would often be previewed on shows like Entertainment Tonight, like this example of a preview of a trailer for The Hunger Games that would be running days later during NBC’s Super Bowl pre-show. 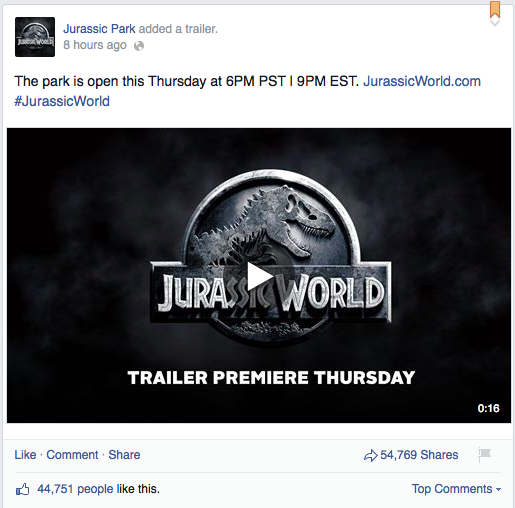 Such efforts have switched online in recent years, both through YouTube itself and through social media: Vine has been used to preview trailers for shows like Game of Thrones, while Jurassic World actually used Facebook and Twitter as the primary medium for this “trailer teaser,” with those accounts posting versions of the teaser directly onto the services rather than embedding the U.S. version available on YouTube (the U.K. embed removes the “NBC Football Thanksgiving” references). Much as YouTube inspired networks or studios to create shorter content that could be shared more readily, which is part of why trailers move so well on social media to begin with, creating even shorter clips and using social media to spread them is both logical and effective: the trailer on Twitter has over 4500 retweets, while the Facebook version has over 54,000 shares. While other efforts—like the transmedia page Universal has created for the new owners of InGen in the film, or the strategic release of dinosaur-free images to various news outlets—are building awareness among fans and readers of online movie news, the “trailer teaser” does that work for more general audiences, adding one more cycle to the hype machine that continues with the trailer release on Thursday, and culminates with the film itself next summer. It is the first trailer released for a given film. It is shorter than a typical trailer, usually somewhere around one minute in length (versus two minutes for a standard trailer). While it may feature footage from the film itself, it makes limited effort to outline the entire “plot” of the film, focused more on character or theme. Let’s use this week’s The Hunger Games: Mockingjay Part 1 as an example. The teaser trailer was released in July, is just over a minute in length, and while it features footage from the film there is no explicit mention of Peeta, or the central tensions of the film. Compare to the trailer, which was released in September, is closer to two minutes in length (1:48), and clearly outlines the film’s focus on Katniss and Peeta as dueling propaganda forces in the ongoing war between the Capitol and the Districts. The problem is that these are not hard and fast rules. For example, the “teaser trailer” for Guardians of the Galaxy is over two minutes in length, although it follows the other two rules: it’s the first trailer released, and it focuses on introducing the film’s characters and action but gives absolutely no insight into the plot of the film. It’s probable the additional length was used to ensure a comprehensive introduction to the characters and the tone of the film, given that it was not an existing franchise—you’ll note that Marvel has labeled it as “Trailer 1,” despite it fitting into other definitions of a teaser trailer. The strategy obviously worked, regardless, given it has a good chance of being the highest-grossing film of the year if Mockingjay Part 1 continues to track behind the first two films in the series. All told, my interest now shifts to what exactly we get from Jurassic World on Thursday. If this ends up being a 15-second teaser for a 60-second teaser trailer, will the Internet revolt? What particular variation on the teaser trailer genre makes sense for a franchise reboot of a series that grew progressively less successful but never entirely erased the goodwill of the beloved original? It’s the question the marketing team at Universal have had to ask themselves, and the question we’ll have answered if we give thanks to the trailer gods on Thursday. While I’m here, I might as well post some of these examples of the genre that I was mentally working my way through in picking examples for this brief analysis. These “Sitch invades Classic Disney” teaser trailers were one of the first to come to mind: they explicitly focus on Stitch as a character, featuring some footage from the film but out of any particular context (Lilo goes unintroduced, for example). The full trailer for the film uses the same idea as its opening, but then begins recounting the plot of the film. Following a similar lead, Scrat is isolated here and sold as the center of the film, comically speaking. This one so obscures the plot of the film that it’s literally just two characters in an animated short film (that Disney allegedly stole from someone else). It’s a big part of why the film’s success caught everyone by surprise. A bit of an odd example of the genre, but I remember seeing this trailer in theaters and finding it so strange: an actual teaser trailer for a live action film, revealing the premise but none of the plot beats. I’m so excited for this ,another blockbuster movie! !I cant wait to watch it! !The trailer is really good! !make me excite more, hmmp I have also seen this http://www.exploretalent.com/articles/take-peek-new-jurassic-world/ .